“This 2017 paper addresses the role of Ireland and Irish republicanism in the geography, biography and political thinking of the French anarchist geographer Élisée Reclus (1830–1905). 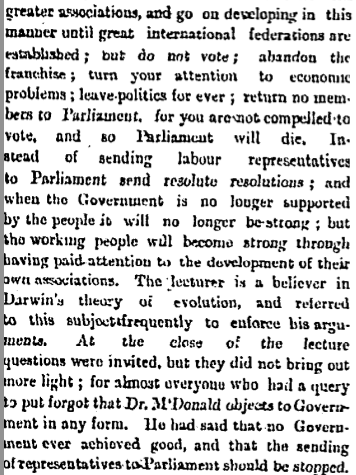 This paper sheds new light on the construction of a scientific and political discourse, one which was radically opposed to external and internal colonialisms in the Age of Empire, analysing primary sources such as Reclus’ texts and correspondence, along with his transnational networks. It draws on present-day debates on ‘geography and anarchism’, postcolonial Ireland and international circulation and localisation of knowledge. Ferretti sees the importance of Reclus’ statements for present debates “in the specific features of anarchist internationalism and anti-colonialism, ideas that closely linked the national question to the social one”. Direct links between Reclus’ circle and Irish Republicans can be seen in the correspondence between Maud Gonne when she was editor of L’Irlande Libre, and the French anarchist Jean Grave. Although peppered with academic language, Ferretti’s paper adds to our knowledge of both anarchist georgraphy and anarchist anti-imperialism in the late 1800s. Thanks to Liam O’Rourke of the Irish Republican Education Forum for bringing this to our attention. 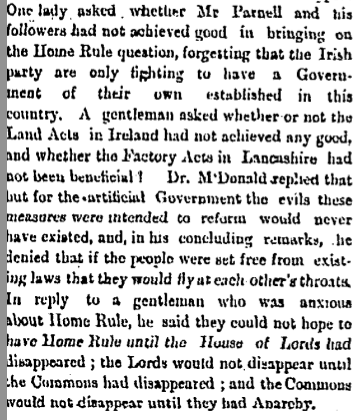 What makes this newspaper report interesting is that it confirms that some form of anarchist organisation existed in Dublin after the demise of the Socialist League, whose Dublin branch was overwhelmingly anarchist, in 1887. 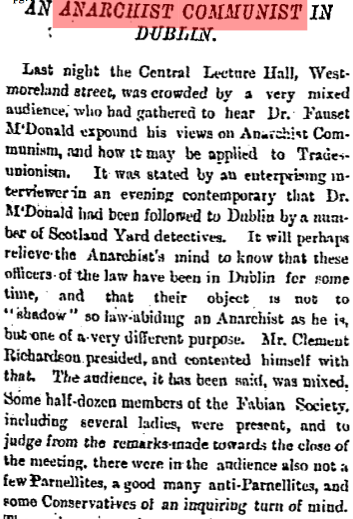 Indeed, as Fintan Lane has written in his Practical Anarchists We: “Nevertheless, at the end of the 1880s anarchism still had a real presence in Dublin, in part sustained by solidarity work for the ‘Chicago anarchists’, men convicted, on threadbare evidence, for alleged involvement in the Haymarket attack of August 1886, when a bomb was thrown at police in Chicago. 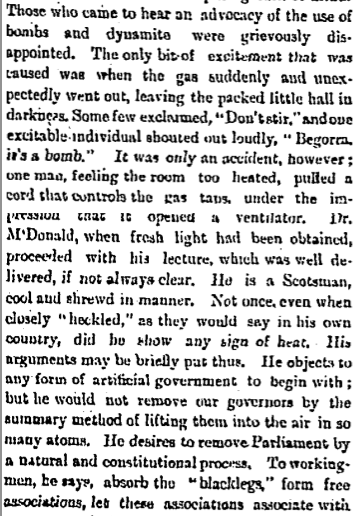 Meetings and debates on the issue were organised, with one event held in October 1887, weeks before four of the men were executed. The Central Lecture Hall was at 12 Westmoreland Street, later the home of Bewley’s Cafe and today a Starbucks. The guest speaker, Fauset McDonald, was a doctor specialising in tropical diseases and one of the founders of the British fortnightly paper The Commonweal. He later moved away from anarchism and was a member of Socialist Parties in Australia and New Zealand in the late 1890s and 1900s. However it transpired that McDonald had also become a racialist. He was condemned by his former comrades in an editorial in the “Commonweal” in July 1907 when he became president of the New Zealand White Race League (which opposed Chinese immigration)..